10) Costo appears to be floating a few inches off the ground. 9) Score's series takes its name from a mediocre Don Henley song. 8) Even beginner Photoshop users would pan this use of the blur tool. 7) With Costo's looks, this card gets a chilly reception from the ladies. 6) Costo sticks out his tongue like Michael Jordan, but he's more "error" than "air." 5) The blur has nothing to do with summer; it's how most Reds fans see the game after a few pops. 4) Costo's pale skin proves he doesn't spend much time outside in the summer. 3) Parents may not be comfortable with the series' unintended homosexual vibe. 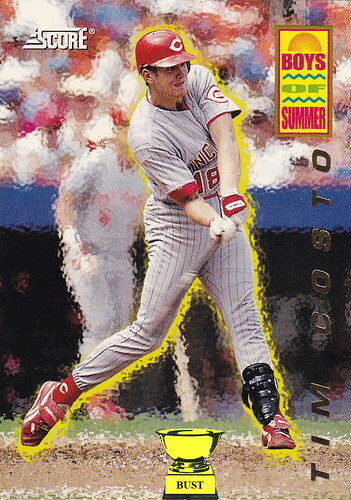 2) If you look at the card from the waist down it looks as if Costo is peeing down his legs. 1) Costo's career stats: .224 batting average, three home runs, 14 RBIs. Forever cold.